SEE FITMENT NOTES BELOW BEFORE ORDERING. 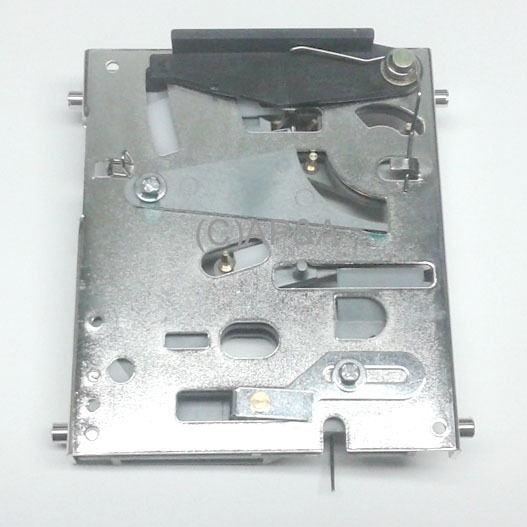 25-cent coin mechanism designed for use with U.S. quarters. Will also accept Canadian quarters when magnet is removed from housing. Also known as coin acceptor, coin rejector, or slug rejector. 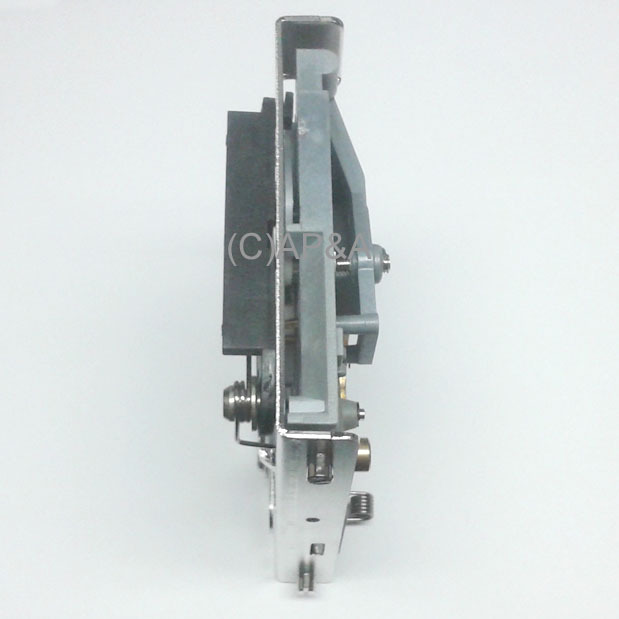 Can be used in virtually any coin-operated game that uses quarters with this type of standard mechanism. Metal construction. Includes removable metal metric-thread mounting studs (part # 42-0125-01) on all four corners for mounting in most any game (see Fitment Notes below). Also includes holes for moving or installing additional mounting studs at the half-way point on either side for mounting in older Chicago Coin, Gottlieb, and Stern games, or others that require studs at mid-point. (For extra studs, use part # 42-0125-01. Installation of studs in middle holes on this mech will require tapping to create threads before studs can be screwed-in). Fully adjustable with all of the quality devices and coin verification features found in any high-quality mech. Measures approx. 3-1/2 inches wide by 4 inches tall. 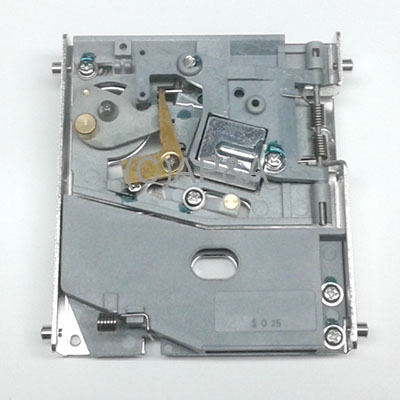 European/Japanese Coin Doors: May not fit on some European or Japanese coin doors that use different size/style mechs. Chicago Coin, Early Stern, Gottlieb Games: Will fit and work when studs are installed in middle holes for mounting (holes are not threaded, so will require tapping before installing studs). May not work with coin lockout mechanism on some models due to thicker material used on this replacement mech. Late-model Bally/Williams Games Late 1980s-Up: Many of these games that do not require studs on the back (coin door side) of the mech will have to have the studs removed before installing. Just un-screw to remove. Williams Games 1965-1982: These games will require using 2 original long studs on the back (coin door side) of the mech, and 1 original retaining tab on the front of the mech. These are obsolete parts, so will have to be re-used from your old mech. Stud holes on this mech will need to be enlarged and tapped to #6-32 size to accomodate original Williams long studs and front tab screws. CHICAGO COIN (See Fitment Note 2): Blue Max, Casino, Cinema, Dolphin, Gin, Gold Record, Hee Haw, Hi Flyer, Hi-Score Pool, Hollywood, Juke Box, Olympics, Rawhide, Red Baron, Riviera, Showtime, Sky Rider, Sound Stage, Stampede, Super Star, Top Ten, more? GOTTLIEB (See Fitment Note 2): 2001, 300, 4 Square, Abra Ca Dabra, Ace High, Airport, Alien Star, All Stars, Amazon Hunt, Amazon Hunt II, Amazon Hunt III, Aquarius, Arena, Asteroid Annie & the Aliens, Astro, Atlantis, Bad Girls, Bank Shot, Bank-A-Ball, Barb Wire, Baseball, Batter Up, Bell Ringer, Big Brave, Big Hit, Big House, Big Hurt, Big Indian, Big Injun, Big Jack, Big Shot, Black Hole, Blue Note, Bone Busters, Bounty Hunter, Bristol Hills, Bronco, Buccaneer, Buck Rogers, Buckaroo, Bumper Pool, Cactus Jack's, Canada Dry, Capt. Card, Car Hop, Card King, Card Trix, Card Whiz, Caveman, Centigrade 37, Central Park, Challenger, Charlie's Angels, Chicago Cubs Triple Play, Circus, Class of 1812, Cleopatra, Close Encounters of the Third Kind, College Queens, Count-Down, Counterforce, Cowpoke, Crescendo, Cross Town, Cue Ball Wizard, Dancing Lady, Deadly Weapon, Devil's Dare, Diamond Jack, Diamond Lady, Dimension, Dodge City, Domino, Dragon, Drop-a-Card, Duotron, Eclipse, El Dorado, El Dorado City of Gold, Elektra Pool, Elite Guard, Excalibur, Extra Inning, Eye of the Tiger, Far Out, Fast Draw, Fire Queen, Flip-a-Card, Flipper Pool, Flying Carpet, Force II, Four Seasons, Freddy: A Nightmare on Elm Street, Free Fall, Fun Fair, Fun Land, Fun Park, Galaxie, Gemini, Genesis, Genie, Gladiators, Goin' Nuts, Gold Strike, Gold Wings, Golden Arrow, Grand Slam, Grande Domino, Gridiron, Groovy, Harmony, Haunted House, Hawaiian Isle, Hearts and Spades, Hi Dolly, Hi-Lo, Hi-Score, High Hand, High Seas, Hit the Deck, Hit-A-Card, Hollywood Heat, Home Run, Hoops, Hot Shot, Hot Shots, Hurdy Gurdy, Hyde Park, Ice Fever, Ice Show, Ice-Revue, Incredible Hulk, Jack-in-the-Box, Jacks Open, Jacks to Open, James Bond 007, Jet Spin, Joker Poker, Jump Shot, Jumping Jack, Jungle, Jungle King, Jungle Life, Jungle Princess, Jungle Queen, Kicker, King of Diamonds, King Kool, King Pin, King Rock, Kings & Queens, Knockout, Krull, Lariat, Lawman, Mario Andretti, Lights...Camera...Action!, Lucky Card, Lucky Hand, Lucky Strike, Magic Wizard, Magnotron, Mars God of War, Masquerade, Mayfair, Melody, Mibs, Mini Cycle, Mini Pool, Monte Carlo, Mustang, Neptune, New York, Now, Nudge-It, Operation Thunder, Orbit, Out of Sight, Outer-Space, Palace Guard, Panthera, Paradise, Paul Bunyan, Pin-Up, Pinball Pool, Pink Panther, Pioneer, Play Ball, Play Pool, Playmates, Pleasure Isle, Polo, Pop-a-Card, Poseidon, Pro Pool, Pro-Football, Psychedelic, Punk, Pyramid, Q*Bert's Quest, Quick Draw, Rack 'Em Up, Rancho, Raven, Ready...Aim...Fire!, Rescue 911, Road Race, Robo-War, Rock, Rock Encore, Rock Star, Rocky, Roller Coaster, Roller Disco, Royal Flush, Royal Flush Deluxe, Royal Guard, Royal Pair, Scuba, Sea Side, Shaq Attaq, Sheriff, Ship Ahoy, Silver Slugger, Sinbad, Sing Along, Skipper, Sky Dive, Sky Jump, Sky-Line, Snow Derby, Snow Queen, Soccer, Solar City, Solar Ride, Solitaire, Space Orbit, Space Walk, Spider-Man, Spin Out, Spin Wheel, Spin-a-Card, Spirit, Spirit of 76, Spot Pool, Spring Break, Star Race, Star Trek, Stargate, Stock Car, Subway, Strange World, Street Fighter II, Striker, Strikes 'N Spares, Super Bowl, Super Duo, Super Mario Bros., Super Mario Bros. Mushroom World, Super Orbit, Super Score, Super Soccer, Super Spin, Sure Shot, Surf Champ, Surf Side, Surf 'n Safari, Surfer, Tag Team Pinball, Target Alpha, Target Pool, Team One, Tee'd Off, Ten Up, Texas Ranger, The Games, Thoro-Bred, Tiger, Time Line, Title Fight, Tivoli, TKO, Top Card, Top Hand, Top Score, Torch, Totem, Touchdown, Troubadour, TX-Sector, Vegas, Victory, Volcano, Volley, Vulcan, Waterworld, Western, Wild Life, Wild Wild West, Wipe Out, Wizard, World Challenge Soccer, World Series, more?